With connected TV adoption rising, advertisers are keen to access an increasingly sizable audience on a sizable screen. In fact, many connected TV ad buyers may pay north of $20 CPMs to do so, according to a new digital ad pricing statpack that eMarketer will be releasing April 10. Over the past few years, interest—and investment—in connected TV advertising has been growing. Advertisers, eager to combine the benefits of digital media buying and measurement with the appeal of sound and motion on the biggest living room screen, are paying top dollar to do so—$20 CPMs or more, according to our research. Each year, we ask buy- and sell-side sources to anonymously share pricing information for our annual look at ad pricing trends. And according to three US buy-side sources, CPMs for in-stream ads on connected TV ranged from $19.84 to $28.33 during the timeframe of Q4 2017 to Q4 2018. Everything that’s wrong with your email. When done properly, email can deliver big for your brand. From open rates and engagement, diving all the way into deliverability, this Campaign Monitor infographic helps you identify everything that’s wrong with your email—and the steps you can take to correct it. Online grocery is a massive, fast-growing market that requires brands and retailers to leverage an evolving set of skills and competencies to succeed. Test your knowledge of grocery ecommerce with this week's quiz, and see how much you know about this ripening market. Take the Quiz. Inside Facebook: Are All These Scandals Starting to Affect Usage? In the latest episode of "Behind the Numbers," eMarketer principal analyst Debra Aho Williamson discusses the recently leaked documents allegedly showing that Facebook used consumer data as leverage. What's going on inside Facebook, and how are these scandals affecting usage? "Behind the Numbers" is sponsored by Salesforce. Listen In. Daily Forecast: What's Behind AR User Growth? 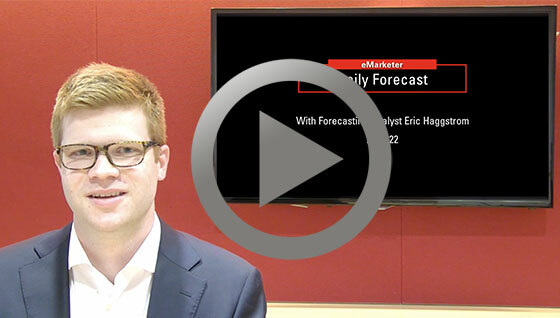 In today’s "eMarketer Daily Forecast" video, forecasting analyst Eric Haggstrom dives into our numbers for augmented reality (AR) audiences. Watch now. eMarketer Daily is published by eMarketer, Inc.